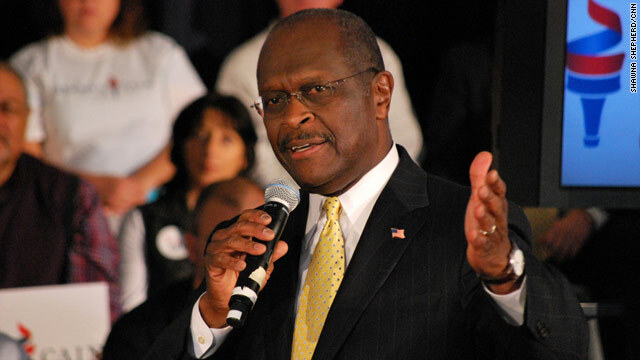 Rock Hill, South Carolina (CNN) – Businessman Herman Cain made one campaign stop in South Carolina before returning to Atlanta to meet with his wife and family after a wave of allegations have threatened his presidential campaign. Political activist Jamie Harrison tried to rally the audience before Cain walked out. "So what do you want him to do? Run, run, run?" The crowd yelled, "Run, run, run!" Political Notebook: CNN’s Candy Crowley and Bob Costantini discuss Herman Cain’s troubles, the ground work Newt Gingrich has yet to do, and employment numbers. Also, a Democratic pollster weighs in on the fight over extending a payroll tax holiday. Cain appeared to be in good spirits as he delivered his stump speech. He told about 200 people gathered that his journey is part of God's plan. "There is God's plan but you see, God doesn't tell you his plan for you until he believes you are ready for those parts of the plan. So I believe that I'm on this journey, I'm on this journey for a reason and I don't look back," said Cain. After he acknowledged "some challenges," Cain said he will address the future of his presidential campaign Saturday at the scheduled opening of his new Georgia campaign headquarters. He said the announcement will "clarify …exactly what the next steps are" for the campaign. "I am reassessing because of all of this media firestorm stuff. Why? Because my wife and family comes first, I got to take that into consideration," said Cain. "I don't doubt the support that I have, just look at the people that are here. We have to look at what happens to contributions and we got to reevaluate the whole strategy." Cain urged his supporters to stay informed. "Because there's a lot of garbage out there on the internet. There's a lot of garbage out there on TV. There's a lot of garbage out there about me, don't you know," he said as the crowd cheered. "There's a lot of misinformation out there so you have to stay informed and check out the facts for yourself." After the town hall, people walked up to Cain and said, "Don't give up on us" and "Don't quit Herman!" As he was getting into his SUV two men shouted, "Herman, America needs you. Don't stop" and "Think of our grandchildren this weekend." This was the candidate's third visit to Rock Hill. Cain has four paid staffers in South Carolina with its headquarters in Columbia. South Carolina Director William Head said they are in the process of opening three field offices in Aiken, Greenville, and Myrtle Beach. Head said, "Obviously the campaign moves full steam ahead." Herman Cain must be one heck of a fool or he thinks thee American people are. What man gives a woman money for 13 years and gets nothing in return? What kind of a businessman is he if after 13 yearshe has not been able to get her into a job. If he got 0 jobs for one person in 13 years what can the American people expect him to do in 4 years. We already know Congress is a "Do Nothing". As someone else mentioned, is God playing a joke on us? Apparently so, given that "God" has allegedly motivated at least three utterly incompetent human beings to run for office. Either "God" is trying to tell us something, or "God" has a real sense of humor, or this particular "God" is demonic. This crop of "Godaholics" is nauseating. Can we keep religion the hell out of politics? Why doesn't he think God is telling him to stop? His plan was upside down ! It is really 666 and not 999 ! A total idiot! "god" tells him and the other repugs that there is a plan for them? This "god" must be responsible for their indiscretions/lies/ignorance/hubris,no? "Oh,god jus'messin wit me".PLEASE ! Scary thing is that these people are apparently given serious consideration for being the nominee of the GOP. Do they not realize how very stupid they are? Or is it that they are relying on the stupid cheese-puff eating,NASCAR watching,Faux news sheep that are so easily led by the nose at any mention of this fairy tale "god"?. GO AWAY, you Godless buffoon. Make nice with your clueless wife, get your mug out of the news as you are a delusional narcissist.